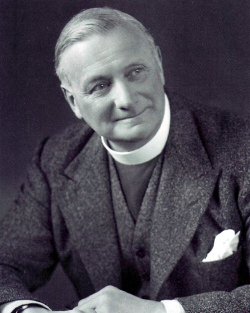 Colin Kerr, founder of Campaigners, was ordained in 1911. He joined the Staff of Cambridge University Mission in 1919 where he ran the Scout Troop. Splendid as Scouting was, Colin was convinced that the Churches needed a youth ministry that was evangelistic. In 1922 while working late in his office God gave him a vision of youth work. Colin immediately committed to paper his concept of Campaigners. Many over the years, have worn the badge with its motto "Unto Him" which speaks of commitment to the Lord Jesus Christ and to his service.